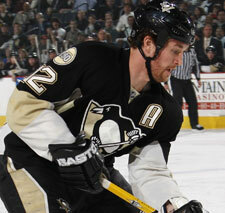 PITTSBURGH (AP) -Unusual enough that the Pittsburgh Penguins scored seven goals without Sidney Crosby. Stranger still, their highest-scoring game all season swung not on all that offense, but a game-changing penalty kill. Tyler Kennedy scored his first goal in 17 games during a three-point night, Chris Minard netted the first goal of his 10-game NHL career and Malkin put in his 39th of the season as the Penguins improved to 12-6-4 when Crosby doesn't play because of an ankle injury. 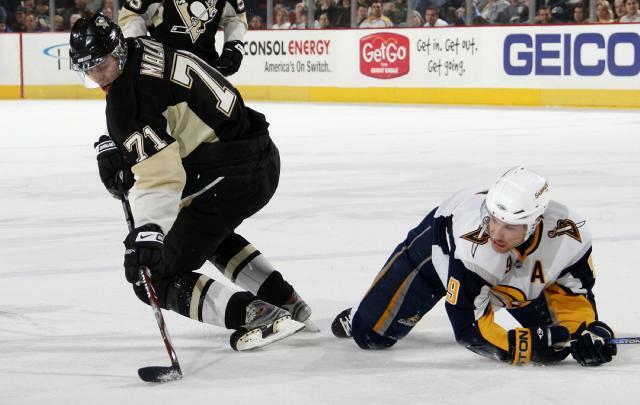 The Penguins swept the season series 4-0 for the first time since the Sabres joined the NHL in 1970, withstanding a five-minute elbowing penalty on Georges Laraque for injuring defenseman Nathan Paetsch early in the second period. Paetsch passed the puck from along the goal line in the Buffalo zone moments before Laraque leveled him with a raised elbow. Paetsch lay motionless for several minutes before being assisted to the locker room with a concussion. He is out indefinitely. Buffalo not only couldn't take advantage of what would have been an extended power play, the Penguins - leading 1-0 - had four good short-handed scoring chances before Jeff Taffe scored 9 seconds into Maxim Afinogenov's hooking penalty. Afinogenov's penalty wiped out the final 1:08 of the extended power play and the Penguins went on to score three goals in the period. The Sabres scratched five players with injuries, including defensemen Jaroslav Spacek (ribs) and Dmitri Kalinin (shoulder), and Paetsch's injury further depleted them.